Gosh, I'm greedy aren't I? Always wanting more....but I am also willing to share my favourite things and so here are some of the lovelies that made me happy today. 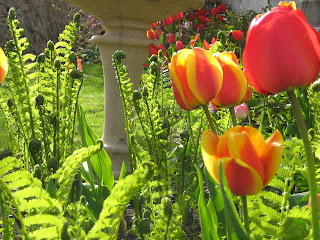 I had a wonderful Earth day, spending most of it out in my garden. I transplanted some raspberries, planted some beans, watered my onions, and planted some green onions. E and I picked Dandelions while S and W went mountain biking. E even picked all the neighbours Dandelions (now wouldn't you like to live next to him?). I watched E make a "seven layer deluxe" mud cake and laughed when he told me, "this is no ordinary cake." Do you remember how much fun it was to make mud cakes? E planted watermelon, zinnia and aster seeds to sprout inside. Did you know that the little plastic four pack plant containers make a very useful, practical way of learning the four times table? 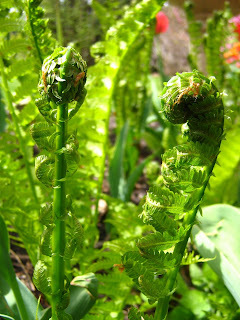 I can't resist my ferns, they drive my husband nuts because I have so many of them. What can I say...I was a West Coast girl. Got to have my ferns! I just love the shape of them all through out their development. And these little ones? 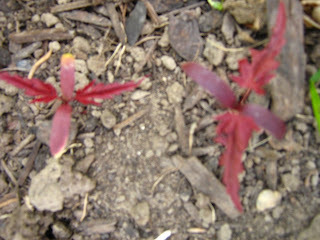 These are Japanese Maple tree babes coming up under our tree, all on their own. Just a wonderful reminder to me of how giving this earth is, and how much I love it. Those ferns are so nice!! I like them a lot. Your garden is so beautiful Heather. 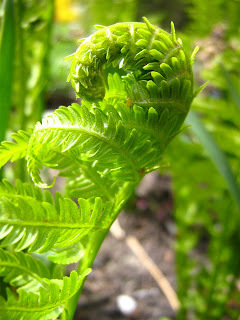 Beautiful pictures of the sun on your ferns - love those shades of green. I just had to post another comment to say that the one I deleted was an accidental second posting of my first comment - OK? Wish blogger would work a bit faster sometimes!